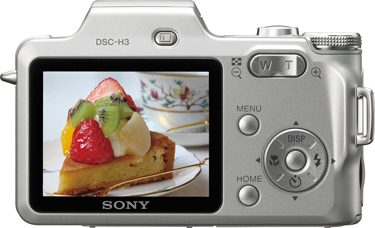 Sony's Cyber-shot digital camera range shows no signs of expanding - at least in physical dimensions that is. The H3 is the manufacturer's smallest ever digicam with a 10x optical zoom, but packs in an 8.1-megapixel lens and an output mode to display images on HD Ready displays. The camera measures just 10.6 x 6.9 x 4.8cm and has a standard-sized 2.5in display, with 115,000-pixel resolution. It also packs a powerful 17x HD Smart Zoom into the shell, which Sony said allows it to capture telephoto images that are suitable for display onto HD screens. The H3's high sensitivity mode enables up to ISO 3200, while the inclusion of a Super SteadyShot image stabilisation mode should help ensure your images don't suffer the effects of shaky hands. The camera's face-detection capability will also automatically adjust expose and flash levels for portrait shots. A 1/2000 second shutter speed combined with what Sony calls "predictive autofocus" gets the H3 ready for fast-moving subjects, a mode that the company's pitching at sports fans. Standard features, such as red-eye reduction and picture retouching, are also built into the camera, and Sony said the additional four image filter effects will help add "sparkle" to your images. 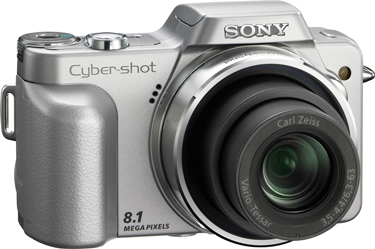 The Cyber-shot H3 will be available throughout Europe from the beginning of September and is expected to retail for £230 ($460/€270).